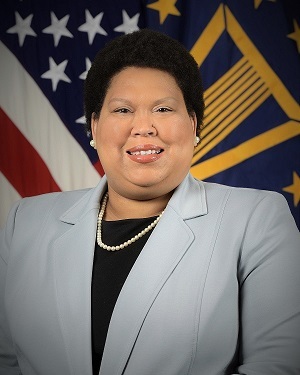 Ms. Veronica Hinton is the Principal Director for Civilian Personnel Policy and provides development and oversight of civilian personnel plans, policies and programs that affect over 930,000 defense employees worldwide. Her portfolio spans the full spectrum of the Human Capital Lifecycle, to include systems evaluation and improvement, performance management, strategic workforce and succession planning, leader development, and talent acquisition, development and sustainment. Prior to this appointment, Ms. Hinton served as the Department of the Treasury’s Associate Chief Human Capital Officer for Human Capital Strategic Management. In this executive role, she was responsible for Department-wide policy, programs, and oversight in all areas of human capital management, including human resources, labor and employee relations, human capital evaluation, and strategic planning and performance management affecting 100,000 employees. Before joining Treasury, Ms. Hinton held various leadership positions in the Department of Air Force and Department of Defense. She served as the Director of the Air Force Senior Executive Management Office and the Director for Personnel Service Delivery Transformation at Headquarters United States Air Force, the Deputy Director for Manpower, Personnel, and Services at Headquarters Air Combat Command, and the Deputy Director for Human Resources Strategic Programs and Advisory Services in the Defense Civilian Personnel Advisory Service. Ms. Hinton holds a Bachelor of Arts degree in History from Texas State University, a Master of Science degree in Human Resource Development from Virginia Polytechnic Institute and State University and a Master of Science degree in National Resource Strategy from the Dwight D. Eisenhower School for National Security and Resource Strategy. She is a graduate of the Department of Defense Senior Leader Development Program and is a Senior Certified Human Resources Professional by the Society for Human Resource Management. Her awards include the Secretary of the Treasury Meritorious Service Award, the Office of the Secretary of Defense Award for Excellence, and five Secretary of the Air Force Meritorious Civilian Service Awards.